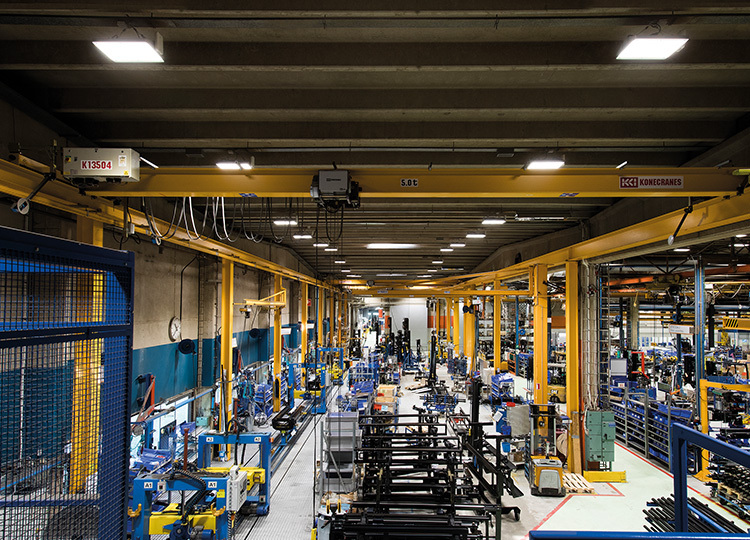 Upgrading your warehouse or factory lighting system is not just a way of saving on energy and maintenance costs. It could be the key to a happier, healthier and more effective workforce. Mark Nicholson examines the potential benefits and advises on how to maximise them. One of the most basic reasons for lighting a workplace well is to ensure hazards are visible. Related to this is a need for even distribution of light, so there are no sudden changes when moving from one area to the next. To do their job effectively, workers must be able to see objects clearly and, where necessary, distinguish between different colours. Their vision should not be obscured by direct or reflected glare, and they should not be subjected to the discomfort of flickering lights. These factors can easily result in problems like eyestrain, headaches and migraine, or in further ‘sick building syndrome’ (SBS) symptoms such as fatigue, irritability and poor concentration. At the very least, improving the quality of light will enhance your employees’ comfort and sense of wellbeing. At best, it will reduce sickness absence and increase productivity. Today, most warehouse and factory lighting upgrades involve switching from HID (high-intensity diode) or fluorescent systems to LED (liquid-emitting diode). Each has advantages and disadvantages, which should be researched before buying, but LED tends to win on energy efficiency and extremely long lamp service life. Although LED’s initial purchase price is higher, the investment is usually recovered within a few years through lower electricity bills. Environmentally conscious staff will be happy to know that LED lights have a lower carbon footprint. With their much greater lifespan and resistance to breakage, they also reduce material wastage – and there are no highly toxic substances to dispose of when they finally expire. Low UV radiation levels are another bonus. LED health benefits claimed by some researchers include fewer headaches, increased learning performance and productivity, less stress and anxiety, and even regulation of sleep-wake cycles. There are counter-claims too. On balance, it seems that if the LED system is of a high quality, with the latest advances and the right configuration, it should have a positive impact. For optimum results, your old lighting system should be completely replaced. If this is beyond your budget, there is the option of retrofitting LED lamps into your existing light fixtures. Complications here might include incompatibility with dimming mechanisms, and unwanted effects from the old lighting’s reflectors. Correct specification and installation of an LED retrofit requires specialist knowledge, so make sure your provider has the necessary expertise. Beware of cheap imported LED products from the Far East and always go for good quality. The ‘colour temperature’ of white lights ranges from warm (yellow) to cool (blue), and your provider should discuss which is most suitable for your needs. Lighting also needs to be specified for the right level of brightness, from ceiling to floor, and positioned to avoid direct or reflected glare. If your building regularly experiences air temperatures well above 25°C, this needs to be considered when specifying a system. LED lighting can be switched on and off instantly, with no delay for warming up and no need for a ‘rest’ before restarting. This makes it ideal for use with automatic on/off switches (motion-activated) and dimmers (linked to light sensors). For maximum energy savings, these should be included in the system. Like all your suppliers, your lighting provider should be chosen with great care. The increasing popularity of LED systems has generated many new businesses in recent years, but some are better than others. Research companies online and look for customer reviews. Try to talk to customers who have used their services. Look for financially stable companies, as intense competition in this market could soon put less successful ones out of business. A good provider will be able to offer a wide choice of high-quality lighting and give unbiased advice on which products are best for you. There should be evidence of expertise in installing systems and avoiding the problems mentioned above. After a detailed survey of your premises, you should be presented with a full business case showing the calculated return on investment. You should also be given advice on any government funding or tax benefits for sustainable lighting. Finally, check the warranty offered and make sure it covers on-site support. Usually it will be for about five years. If it’s a lot longer than that, beware of conditions, exclusions and costs which might make it difficult to submit a claim. 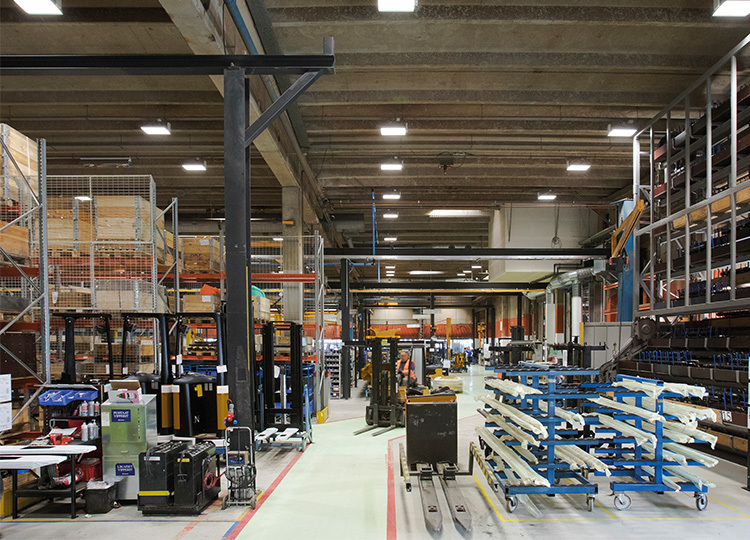 Completely new LED system for Cat® Lift Trucks premises in Järvenpää, Finland. Refit phase 1 covered 17,000 m2 of factory, warehouse and outdoor space, and took less than 3 months. Phase 2 will light the offices (3,000 m2). The previous high-pressure sodium HID lighting suffered from massive energy consumption and gave very poor colour rendering. 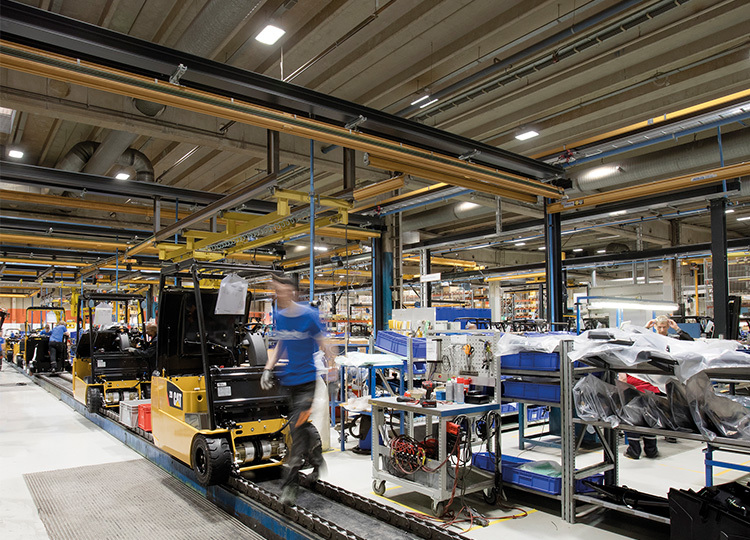 Järvenpää houses the Cat® global design centre, which especially requires optimal light distribution and true colour visibility. Sustainability is a core value of the company, so energy efficiency is very important. Wireless automatic control. When no human movement is detected for 2 minutes, lights dim to 10% power to save energy and extend service life while maintaining safety. After another 2 minutes, they go out completely. Once activity is sensed, light is immediately restored – at a level which takes the amount of daylight present into account. Luminous intensity is the same as before at floor level, but light quality and energy efficiency are much improved. The system is also self-adjusting, so it can adapt automatically to changes in layout or processes, while maintaining safety. Operational efficiency has increased by 7%. There is also a higher level of employee satisfaction, with 98% reporting improved working conditions. Visibility during the hours of darkness is now clearer. The lighting feels natural and fresh, like sunshine, compared to the previous yellow effect. In the past, staff had to go outdoors to check colours! The annual saving on energy consumption is 70%, which equates to about €72,000. This will pay back the investment within 4 years 7 months. It would have been 6 years, but Finnish government support for energy-saving projects reduced the cost. Signify (previously known as Philips Lighting). Chosen because of its technological leadership and existing global co-operation with Cat Lift Trucks and its parent organisation. Its advanced systems ensured that all of the customer’s specific performance requirements could be met. The customer has been very impressed by Signify. All technical demands and energy-saving targets were fulfilled. The project was delivered on time and on budget. The system’s intelligence and advanced technology will ensure that needs are met well into the future. Signify also provided all the necessary information and forms to apply for a government grant. It provided a turnkey solution, taking care of everything from illumination calculations and equipment specification to comprehensive system installation and disposal of old lamps.